How to clear conditionally hidden fields on submit? 2. I'm using conditional logic to hide/show fields based on one question. i.e. amount of teams. If the user chooses 1 team, the required information for one team shows up, if the user chooses 2 teams, the required information for two teams shows, etc. What is happening is if a user chooses 7, starts to fill out the form, and then changes their amount of teams from 7 to 2, the form will not allow the user to submit since there is required information on teams 3-7, though those teams are no longer chosen. What can be done so that the user can make an alteration to the number of teams (higher to lower) without receiving an error when they submit? 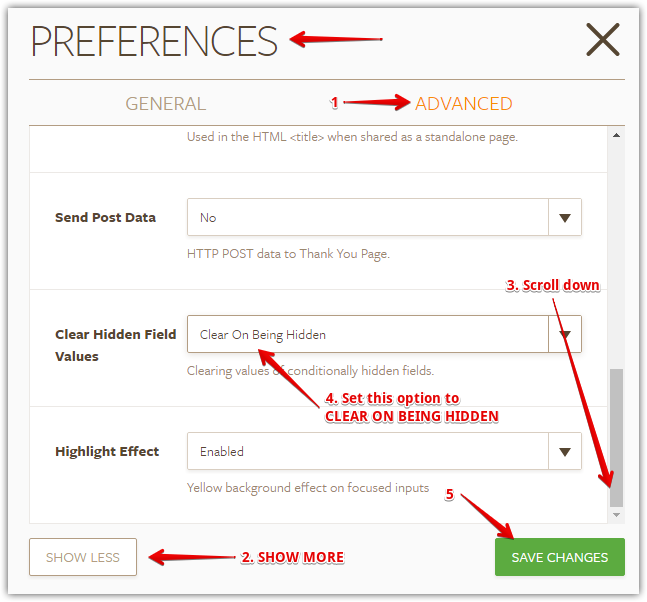 This can be fixed by setting your Form Preference's Clear Hidden Field Values to Clear on Being Hidden. Just click the PREFERENCES icon at the top of your FORM BUILDER > ADVANCED tab > click SHOW MORE > scroll down > then change it to CLEAR ON BEING HIDDEN. Give it a spin and let us know if you'd need more help.